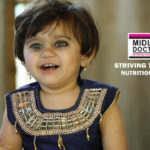 MDAUK received a major boost to fundraising via a $100,000 corporate donation from Bank of America Merrill Lynch (BOAML). 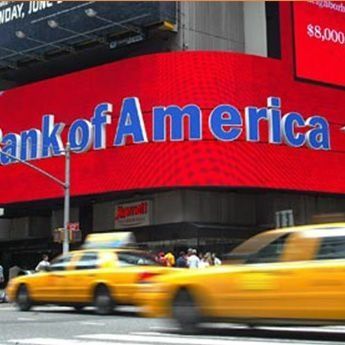 The Bank’s Corporate and Social Responsibility section has been involved in providing donations to many worldwide disasters recently, including the Haiti earthquake. 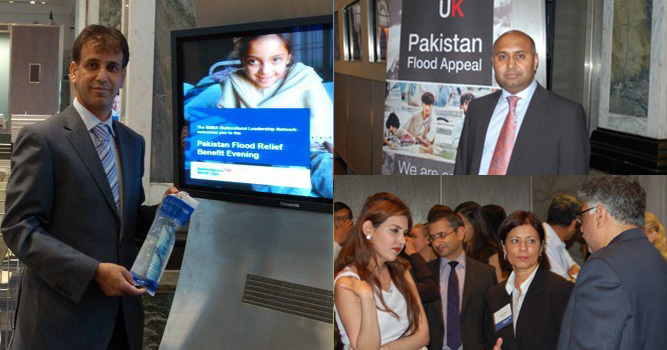 BOAML selected to support MDAUK, Save the Children and World Food Aid program for their Pakistan Flood Relief work. The BOAML donation is to be utilised for the short term flood relief work, medium term MDAUK village rebuilding program and long term support of the MDAUK Hospital construction project. The MDAUK team was invited to the BOAML City of London offices in St Paul’s to receive this donation. BOAML staff’s Multicultural Leadership Network (MLN) helped organize the event and also used the event to raise further donations from staff. 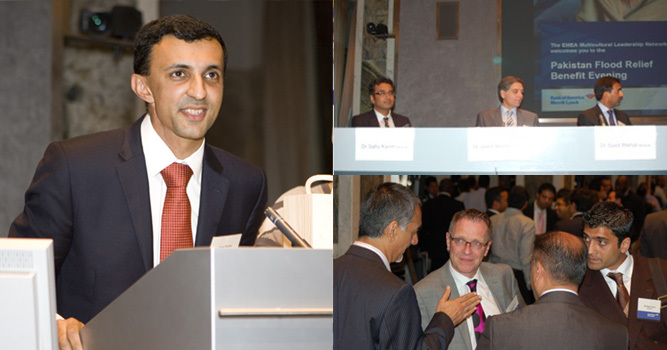 The event was sponsored by the EMEA co-Head of Global Markets Sales and Trading, David Gu. 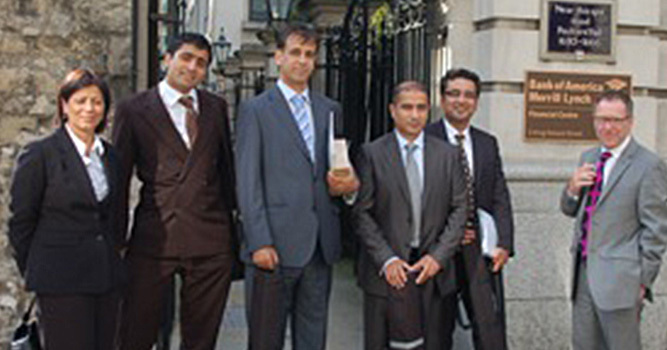 The event was hosted on the night by Sajjad Rashid, Global Business Strategy Executive, Global Funding Business. There was an exceptional turnout at the event, which was provided free of charge by the Bank with many gracious volunteers wanting to ensure every penny raised for MDAUK was to be spent on those who needed it most in Pakistan. Many corporations with affiliation with BOAML also generously donated raffle prizes to be utilized at the event. 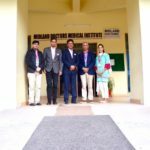 Dr Syed Iftikhar, Chairman MDAUK provided a speech giving insight into his recent visit to the disaster region of Pakistan’s Sindh area. Dr Javed Ahmed and Dr Safiy Karim also joined Dr Iftikhar to answer questions from the Banking associates at the event. There was also an informative stand on the night provided by the Lifestraw team, which highlighted a simple lifesaving filtration device for areas without clean water. 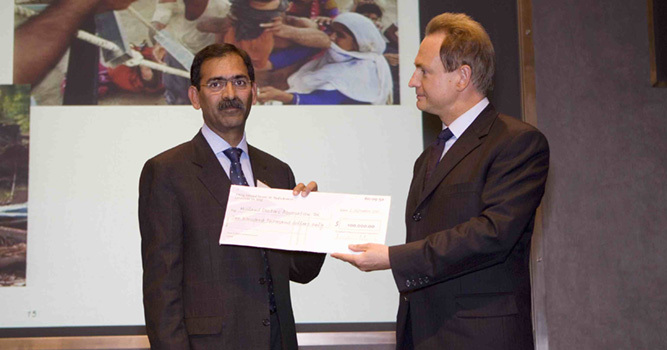 Jonathan Moulds, President BOAML Europe presented the corporate donation of $100,000 to Dr Iftikhar and MDAUK. 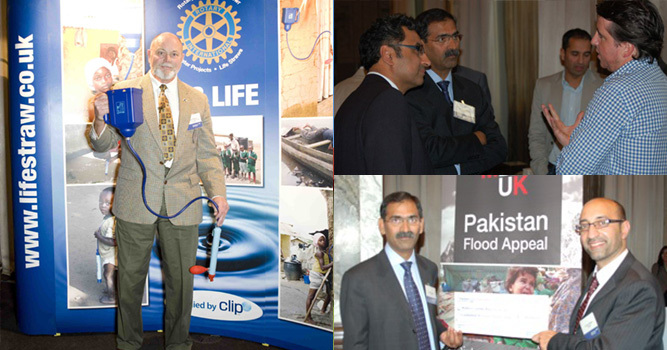 The insight and support from the Banking sector really shone through in their support of affected people of Pakistan. The fundraising leading up to the event and on the night meant the MLN helped raise a further £35,000 for MDAUK direct from the generous staff of BOAML and other attendees! MDAUK are indebted to BOAML for their support and hope to continue this partnership over the coming years as the longer term projects reach fruition.